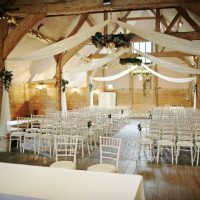 2016 Award winners Lains Barn, offers a unique and versatile licensed venue for weddings, including civil ceremonies and receptions. 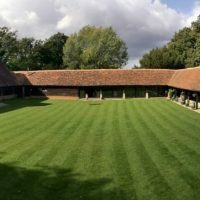 With a long history dating back to 1750, the classic timber former grain barn is nestled in peaceful Oxfordshire countryside. Flanked by picturesque fields, Lains Barn stands at the gateway to the North Wessex Downs, an area of outstanding natural beauty. 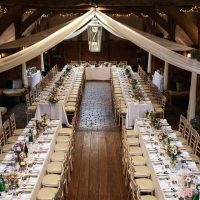 Accommodating up to 180 seated guests you can hold the celebration of your dreams in the beautiful oak beamed main barn, glass fronted byre or outside on the large lawned courtyard. 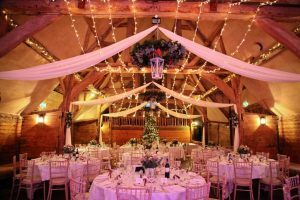 Following its sensitive conversion, the Main Barn creates a rustic ambiance with quirky features including minstrel’s gallery and oak vaulted ceiling. Perfect for ceremonies and receptions, the space provides a stunning backdrop for your choice of decorations. Huge barn doors open majestically onto the beautifully maintained lawned courtyard allowing you to make the most of both indoor and outdoor spaces. Full length sliding glass doors can be opened to the courtyard, making this stunning setting a versatile space for dining, receptions or drinks. For long lazy summer evenings the open fronted covered wing provides an alternative to the glass fronted Byre. 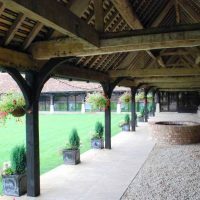 Overlooking the courtyard and situated directly opposite the main barn it is the perfect setting for outdoor ceremonies and as an extension to the other spaces. At the heart of Lains Barn lies the Lawned Courtyard. Choose to hold your ceremony and reception here as a standalone setting. Alternatively use the lawn in conjunction with one or all the covered spaces for a truly bespoke celebration. Bespoke quotations allow couples to plan their memorable day to reflect their personalities. The 5-star catering team offer a range of set and bespoke menus, crafted using the freshest and locally sourced ingredients. Barbeques, hog roasts, picnics and buffets through to a la carte fine dining are all offered to suit your requirements and tastes. The fully equipped bar, staff and manager are at your disposal for the duration of your celebration. Choose from a selection of set drinks packages or tailor your own to ensure your guests are kept well-watered throughout the day. Despite the barns age it still boasts modern facilities including, wheelchair access, disabled parking and baby changing facilities.